On behalf of WirtschaftsWoche, the consulting company Munich Strategy Group determined the champions of innovation within German medium-sized companies: the top three spots are held exclusively by Bavarian enterprises and, of the top 50, one-third of the medium-sized companies with the most creative ideas are based in Bavaria. Rational AG from Landsberg am Lech, in Upper Bavaria, is the winner. The developer of cooking equipment for professional use has a high standard of quality and constantly continues to further develop their products. That is how they become the undisputed world market leader. The 300 professional cooks working at the company know the practical requirements down to the smallest detail and develop custom-made, innovative solutions. The almost 480 patents are a formidable verification that the innovation strategy of the Bavarian winner guarantees its success in business. Second place was awarded to the specialists for compressed air, Kaeser Kompressoren, located in Coburg. The family business from Franconia focusses on the further develop of the intelligent linking of machinery and equipment to the advantage of its customers and is thus a pioneer of Industry 4.0. The customers can automatically have operational data from their compressors transmitted to the Kaeser headquarters. There, the data can be used to immediately identify any irregularities and rectify them accordingly. The findings discovered in this manner furthermore provide an important contribution to optimising products. The specialised films manufacturer Infiana, located in Forchheim, came in third. The medium-sized Franconian company pays particular attention to research and development. The in-house laboratory works on innovative solutions to satisfy the diverse range of customer needs. Special films must be suitable for the broadest range of tasks. The development team at Infiana ensures that the customers receive the exact film for their needs. Research and development are among Bavaria's greatest strengths. 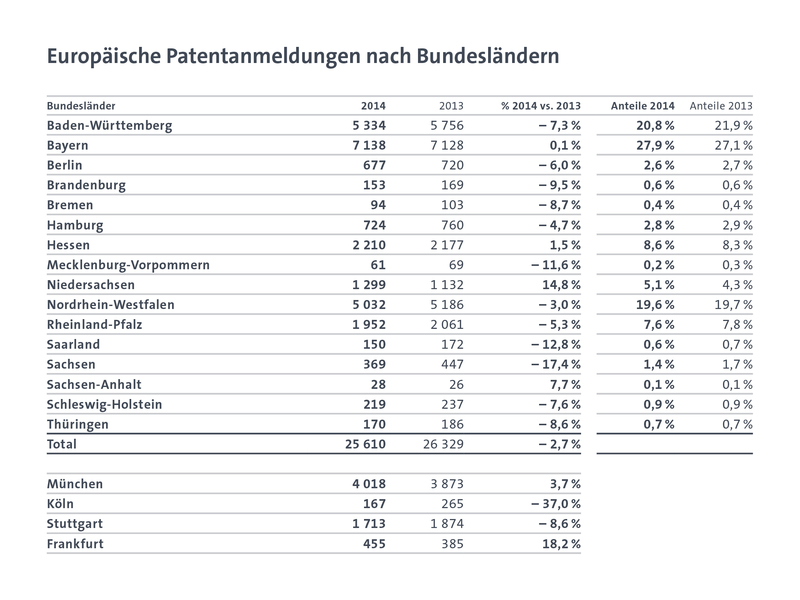 No other state had as many applications for patents this past year: Bavaria leads in the statistics at the German Patent and Trademark Office as well as at the European Patent Office. Bavaria is thus a top location for innovative companies – an excellent choice for investors from all over the world! What do full beards and start-up companies have in common? Well, both are very popular at the moment. Bavaria can boast another entrepreneur and innovation centre – TechBase officially opened in Regensburg on April 14. Technology-oriented entrepreneurs, start-ups and companies can find a new home here. The new building for northern Bavaria's only Max Planck Institute in Erlangen will be ready in early 2016. Being one step ahead is nothing new for the city of Erlangen. It regularly scores top marks in studies and rankings, so the result of IW Consult Cologne's Regional Ranking 2014 comes as no surprise.